CASABLANCA — Whenever there is a soccer game in Casablanca, the town descends into chaos as dozens of supporters of the city’s two teams, Wydad and Raja Club Athletic, and their opponents storm through the city center leaving a trail of destruction in their wake. But after a soccer riot last month resulted in the death of Hamza Baqqali, 21, Morocco is doing some soul-searching about the causes of increasing hooliganism and ways to prevent it. 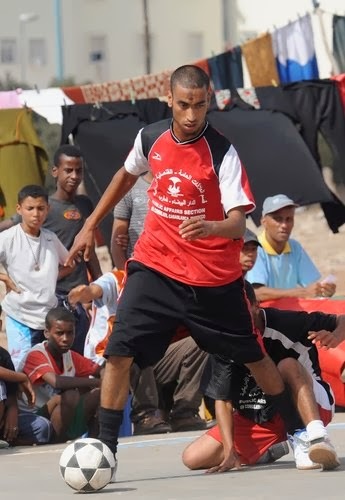 Soccer violence waxes and wanes in various countries, but this scourge has reached Morocco only in recent years. It is still mainly limited to Casablanca — the country’s largest city and economic capital. Casablanca’s stadiums have become battlegrounds, attracting teenagers from underprivileged neighborhoods with nothing to lose, acting out their anger. The destructive mob behavior seems to be the result of decades of failure in the education system and of the country’s inability to give hope to its disenchanted youth. Clifford Stott, a Britain-based consultant for governments on the management of crowd violence, says that in most cases, violent acts are triggered by a desire of those without power to strike at people they perceive as privileged. Mr. Stott says that the games become a venue where people can feel powerful and relevant. Such acting out can mean very unpleasant consequences for their victims. Fayrouz Yousfi and her friends were walking on a main avenue in Casablanca on the way to a bar on the night of a game between Raja Club Athletic and FAR of Rabat. She recalls feeling her glasses flying off her face and the next minute, she and her friends were on the ground getting smacked and robbed of everything, including phones and purses. Ticketless youths are allowed in the stadiums at half time — in an attempt to get them off the streets and prevent them from attacking people. Despite tight security, a game between Wydad and FAR went sour on April 14. Rioters threw stones, snatched benches and punched each other inside the stadium. Mr. Baqqali, a Wydad fan, was beaten to death, and the sports facilities significantly damaged. The immediate reaction of the soccer federation was to punish Wydad by ordering it to play its next four games at home in front of empty seats. A public debate began on how to stop the hooliganism, leading the authorities to take new measures. Minors are not allowed inside stadiums without an accompanying adult, and additional police officers are now posted at the stadiums. A committee was also appointed to create a national strategy to counter hooliganism. Mohamed Ouzzine, the minister of youth and sports, said the crowd violence was a worrying indication of societal problems. Some dedicated soccer fans say that the violence is tarring what had been a healthy activity. Mohammed Rachid, 26, of Casablanca, has been a soccer fan for seven years and member of the “Green Boys,” a reference to the colors of the Raja Club Athletic. He dedicates himself completely to his team, organizing choreography like forming flags in the stands. He follows the team everywhere, even abroad. Supporters like him say that the sense of belonging to a tribe has given them a real purpose in life. They feel they are actually a part of the team. Of course, crowd violence happens in other sports and other countries. Last June, serious rioting broke out in central Vancouver, Canada, after the defeat of the hometown Canucks in the National Hockey League playoffs. Mr. Stott says that governments must deal with the roots of social problems while providing security at games. He recommends scattering small numbers of police officers around stadiums and other areas rather than making heavy shows of force with riot police officers and armored vans.